Every day, around 15 million Uber trips happen across the world. With the launch of Uber Vouchers, businesses now have the opportunity to cover the cost of these rides to move their customers and guests where they need to go. Uber Vouchers make it easy for businesses of all types to sponsor transportation and create a differentiated experience — attracting new customers, rewarding existing ones, or enhancing customer service — by taking care of getting them there. For the past year, our team has worked with businesses to design a new experience that creates deeper connections between them and the people who use their services. We’ve learned they want to offer transportation at scale with flexibility and control. By working with a diverse group of retailers, restaurants and service providers — including Westfield, TGI Fridays, Live Nation, Sprint, and the Golden State Warriors — we are discovering more use cases to integrate vouchers into a customer’s experience and drive business value. We are continuously adding new features and partners—including Allstate and MGM Resorts—to broaden the program. In today’s evolving retail landscape, high-end shopping center operators know the importance of providing a white-glove guest experience. Retailers have started to incorporate transportation into their overall customer service strategy to make a visit to their stores hassle-free. Westfield is using Uber Vouchers to design promotions around complimentary rides for guests to drive foot traffic to centers—especially during key events and seasonal promotions. “Being able to surprise and delight our customers with a complimentary ride with Uber is a great way to build upon our broader national partnership and make it more convenient than ever to travel to and from our shopping centers” said, Lili Fakhari, Senior Regional Marketing Director, Unibail-Rodamco-Westfield. Uber Vouchers also creates new opportunities for our restaurant partners on Uber’s platform. While many restaurants are already leveraging Uber Eats to reach more consumers with delivery, they now have the ability to promote dine-in experiences by removing barriers to get to their physical locations. With the rise of on-demand entertainment, convenience is key for anyone deciding between an evening at home or a night on the town. Uber Vouchers allow the Golden State Warriors to bundle their offers or provide a loyalty perk, offering their fans more choices in how they experience a game, starting with an easy way to get there. “The fan experience is of vital importance to the Warriors organization, and it really begins the moment a fan departs for a game,” said Brandon Schneider, the organization’s Chief Revenue Officer. With Uber Vouchers, Warriors fans receive a voucher directly from the organization and can save it to their Uber account with a single tap. Companies who already offer customers shuttle or rental car services can also make effective use of Uber Vouchers. The vouchers can provide a real-time, flexible transportation option for customers while reducing operational overhead and fixed costs. We have been working with many partners across hospitality and auto insurance, testing Uber Vouchers as part of their customer service and see a tremendous opportunity to use on-demand technology to improve their customers’ experiences. 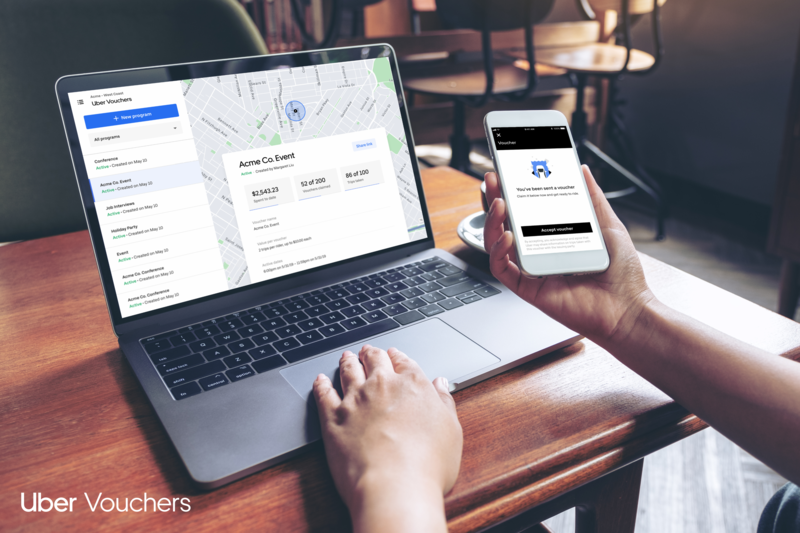 As businesses continue to look for innovative ways to engage with their customers, Uber Vouchers web-based tool and API provides access to Uber’s technology to enhance their customers’ overall experience while satisfying their business goals. The team has been inspired by the versatility of this product and are excited to explore additional opportunities with our business partners for their customers, our riders. Any business across any vertical can start using Uber Vouchers today to as it is now available in most cities where Uber operates globally. For more information, please visit uber.com/vouchers.